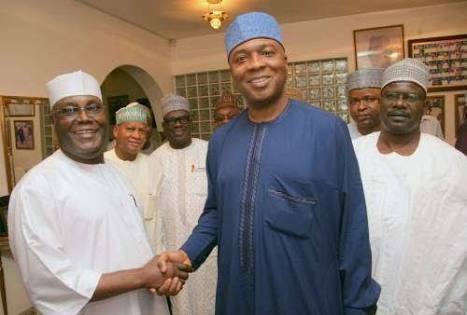 Senate president Bukola Saraki has said that he’s confident of the victory of the presidential candidate of the Peoples Democratic Party (PDP), Atiku Abubakar in the 2019 presidential election. Saraki, who is also the Director General of the PDP Presidential Campaign Council, assured that, given the mounting support by Nigerians, Atiku will coast to victory in the February 2019 presidential election. Saraki was said to have stated this while inspecting the Legacy House headquarters of the PDP Presidential Campaign Council in Abuja on Tuesday. A statement by the spokesman for the PDP, Kola Ologbondiyan said Saraki made the assertion while being conducted round various offices at the party’s campaign headquarters by the PDP LNational Chairman, Prince Uche Secondus. The President of the Senate was quoted to have promised to effectively harness and coordinate all efforts and lead the party and its candidate to victory in the elections. “Since the emergence of Atiku Abubakar as PDP Presidential candidate, there has been renewed hope among Nigerians towards actualizing their collective quest to rescue our nation from the misrule of the incompetent, divisive and deceptive President Muhammadu Buhari-led All Progressives Congress (APC) administration. “Already, Atiku Abubakar’s candidacy has reunited Nigerians across board and reawakened our collective consciousness towards the restoration of purposeful leadership and national productivity, irrespective of ethnicity, religion and political affiliations. “The PDP therefore urges Nigerians to continue in mobilising for the election and be ready for an issue-based campaign that offers solutions to the myriad of security, economic and social problems the Buhari administration has plunged our nation into,” the statement added.